American Lancia Club reunions - typically one on the West Coast and one on the East Coast. The image above was from the East Coast Rally, from 2008, showing Mike Kristick's Aprilia Bilux. Steve Katzman and Tony Nicosia can be seen looking to the left, with the Steermans walking by Geoff's B20. 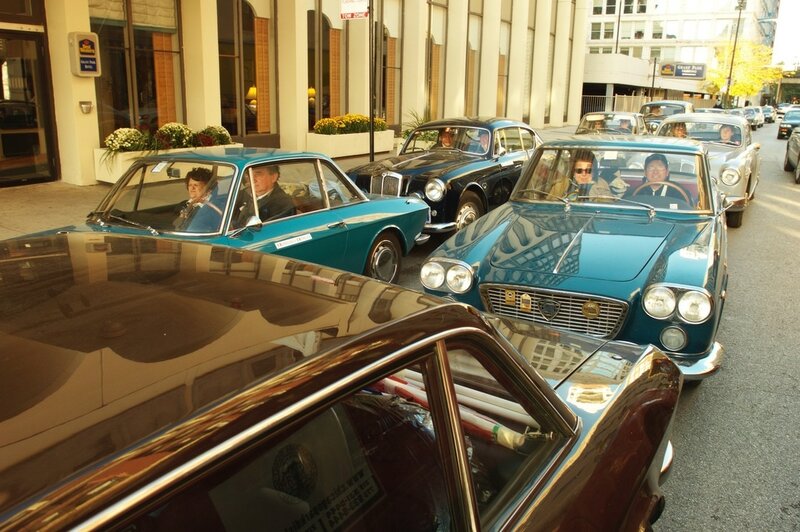 Each country in Europe has a Lancia Club, which hold their own meetings. This includes the Swiss, French, Dutch, Scandinavian, and German clubs. Mike Kristick, American Lancia parts guru, and Mark Wolf next to Mark's 1.3HF at Hunt Radnor show in 2016. Around 2008, several Lancistas from Italy brought cars to the US and drove Rt. 66 across the country. Here they are in Chicago - never thought we'd see this!